An eerily similar incident occurred in 2016 involving a Southwest flight and the same type of engine. Aviation authorities will begin ordering airlines to inspect a certain type of jet engine after this week's midair explosion that forced a Southwest Airlines flight from New York to make an emergency landing in Philadelphia. One passenger was killed and several others were hurt during Tuesday's panic in the skies. The Federal Aviation Administration said late Wednesday it will issue its "airworthiness directive" within the next two weeks, requiring fan blades of engines known as CFM56-7B to be reviewed when they reach a certain number of takeoffs and landings. Blades that fail the inspection must then be replaced. Southwest had already said that all of the CFM56-7B engines on its Boeing 737 fleet will be reviewed within 30 days, as the joint company that creates the machinery, a pairing of General Electric and Safran Aircraft Engines, announced it was sending 40 technicians to support the thousands of upcoming inspections. But the sudden moves have some aviation experts asking why checks weren't done sooner — particularly after an eerily similar incident just two years ago, when a Southwest plane's fan blade broke off from an engine during a flight. At the time, investigators noted signs of metal fatigue. The National Transportation Safety Board said Tuesday that preliminary evidence in the latest accident indicated metal fatigue where a fan blade snapped off the engine. Part of the engine's covering had also blown off, leaving it partially exposed. 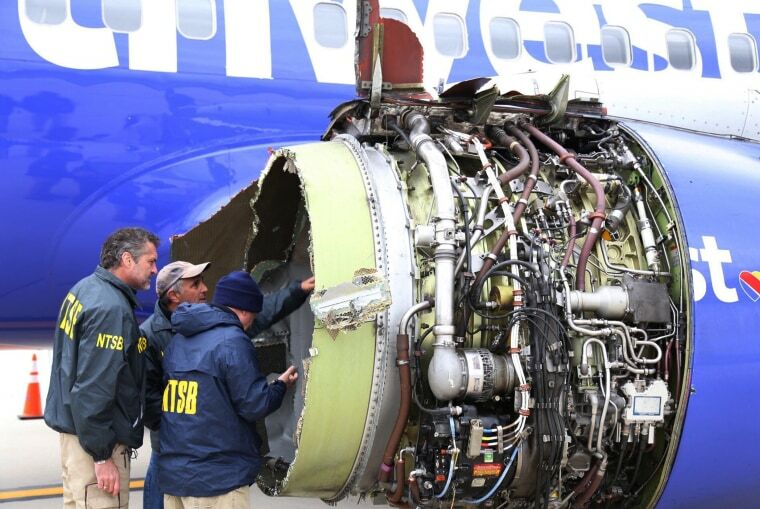 On Wednesday, NTSB Chairman Robert Sumwalt said the fan blade had separated in two places. "There's a fatigue fracture where that comes into that hub," he said at a news conference. "It also fractured roughly halfway through it, but it appears that the fatigue fracture was the initiating failure." After the engine ripped apart 20 minutes into the flight, it sent shrapnel through the fuselage and shattered a window, causing one passenger to be partially sucked out the window, officials said. The passenger, Jennifer Riordan of Albuquerque, New Mexico, later died. The August 2016 incident prompted the FAA the following year to propose inspections of similar fan blades and their replacement if needed. But that "airworthiness directive" was never made mandatory, allowing time for a public comment period. "Is two years too long a period? Bureaucracies on technical issues do not move quickly," said Anthony Roman, a former corporate pilot and aviation security expert with Roman & Associates. "The practice is rather slow and meticulous, unfortunately." He added that airlines such as Southwest could willingly undergo intensive inspections without the FAA's ordering, but that slows down aircraft operations, which also costs them profits. Aircraft "don't make money when they're on the ground," Roman said. CFM International said more than 8,000 of its CFM56-7B engines are used to power 737s around the world. The engines are widely considered a reliable workhorse. Sumwalt told reporters Tuesday that his agency remains particularly concerned about airlines detecting metal fatigue. "There needs to be proper inspection mechanisms in place to check for this before there's a catastrophic event," he said. Metal fatigue is "extremely uncommon" on airplanes, but it can occur, said Scott Hamilton, an aviation industry consultant with Leeham Co., near Seattle. Fan blades, he added, rotate several thousand revolutions per minute, and can become tired and crack. "The human eye can't detect these microscopic cracks that would indicate metal fatigue," he said. "You need a machine to do that, which the airlines have." Southwest CEO Gary Kelly told reporters Tuesday that the plane involved in the latest accident has been in service since 2000, and was most recently inspected on Sunday. "I'm not aware of any issues with the airplane, any issues with the engine involved," Kelly said. Southwest did not immediately respond to a request for comment Wednesday about whether it had carried out any inspections of its CFM56-7B engines' fan blades since 2016. It also remains to be seen whether there's any connection between what happened this week and in 2016, when parts of a Southwest jet's left engine broke apart en route to Orlando, Florida, leading to an emergency landing. No one was hurt. NTSB spokesman Keith Holloway said Wednesday that the agency is investigating the latest accident as a separate event. Sumwalt said it was too early to tell if there was a connection between the 2016 flight and Tuesday's. Tuesday's frightening flight has taken on more urgency because it led to a death — the first on-board fatality in Southwest's 51-year history. So far, two other carriers — Korea Air Lines and Japan Airlines — said Wednesday that they were planning to carry out voluntary inspections of engines that use the same type of fan blade. American Airlines said it had already started such inspections to more than 300 planes following the FAA’s proposal last year. Earlier this month, European regulators began requiring a similar inspection by early next year following a study of the 2016 incident. Alex Johnson and Reuters contributed.